Tender chunks of boneless chicken breast cooked in an aromatic creamy tomato sauce. 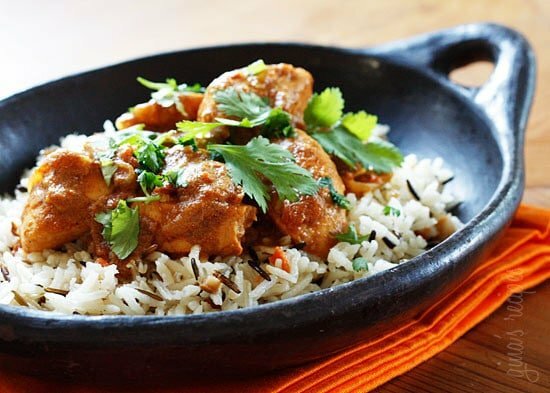 Chicken tikka masala, probably the most popular dish on the menu of any Indian restaurant here in the states, but ironically this dish is claimed to be originally from Britain and is actually Britain’s national dish. I’ve attempted a skinny version of this dish many times without all the cream and ghee (clarified butter) yet never felt quite satisfied with the results. I almost gave up figuring this is probably just one of those dishes that does not lighten up well, after all it’s also known as Butter Chicken! There is no standard recipe for chicken tikka masala; a survey found that of 48 different recipes, the only common ingredient was the chicken so I am sure we all have different ideas of what it should taste like. This week I stumbled on this recipe from a throw down with Bobby Flay from the restaurant Saffron on the Hudson. I gave it another shot using fat free yogurt and low fat milk in place of the cream and we felt for a lightened up version it was pretty darn good and not too complicated, my kind of recipe! 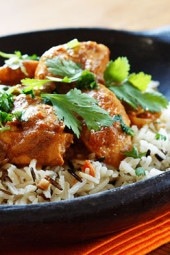 I served this over a basmati medley but this would also be wonderful with naan. Heat oil in a large heavy skillet over medium heat. Add the onions and cook until golden. Add the crushed ginger, stir for a few minutes then add the garlic and cook another minute. Add cumin, garam masala, turmeric, chili powder, and salt; mix well until fragrant, about 2 minutes. Stir in tomatoes, yogurt and milk. Simmer on low heat until sauce thickens, about 10 minutes. Add chicken and simmer for 10 – 15 minutes or until cooked through. Add a generous amount of chopped cilantro and serve with Bamati Rice or Naan.